I have eaten so many salads recently that I think I might turn into one. Salads have become very trendy, as well as very creative, in restaurants. Instead of the boring tomato, cucumber, lettuce routine, restaurants are always using unusual ingredients to try to get us to eat our veggies while they market a healthy menu item. Well, I have had a couple of salads recently that are worth mentioning and are worth recreating. In Australia, I had one of the best salads I think I have ever eaten. 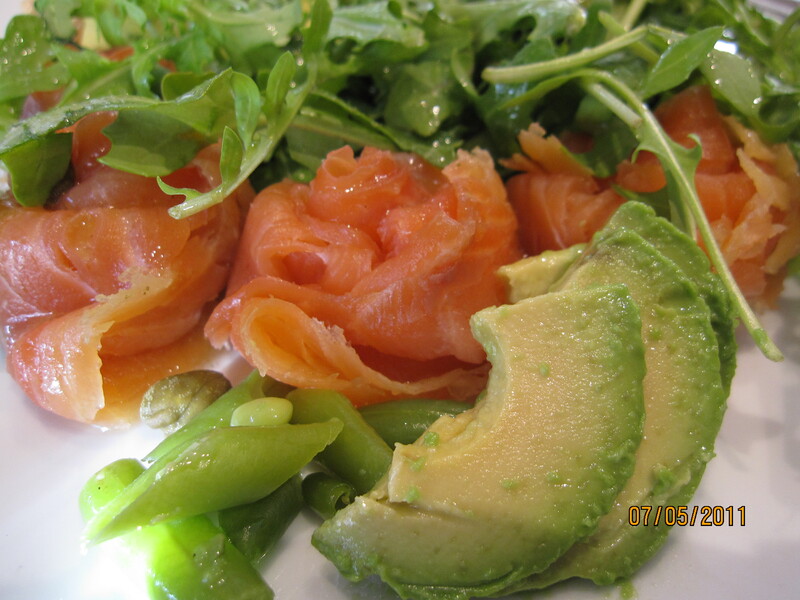 It’s lettuce base was rocket… that is Australian for arugula… and was topped with avocados, green beans, smoked salmon, and a basic lemon vinaigrette (white wine vinegar, lemon juice, olive oil, herbs). There was something about the combination that was just so refreshing. So, naturally loving a challenge, I tried to make it myself when I got home. Ok, so my salmon wasn’t nicely twirled as it was in the restaurant, but the flavor was pretty similar! 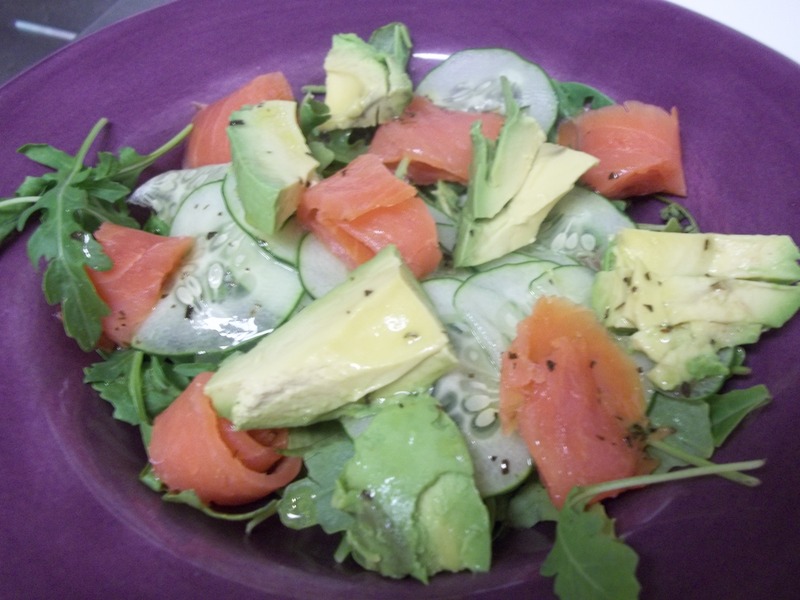 The smoked salmon was such a great change from the usual chicken that I put on salads for my protein fix. The other noteworthy salad was served at a friend’s house the other night. She took it from a Top Chef cookbook. 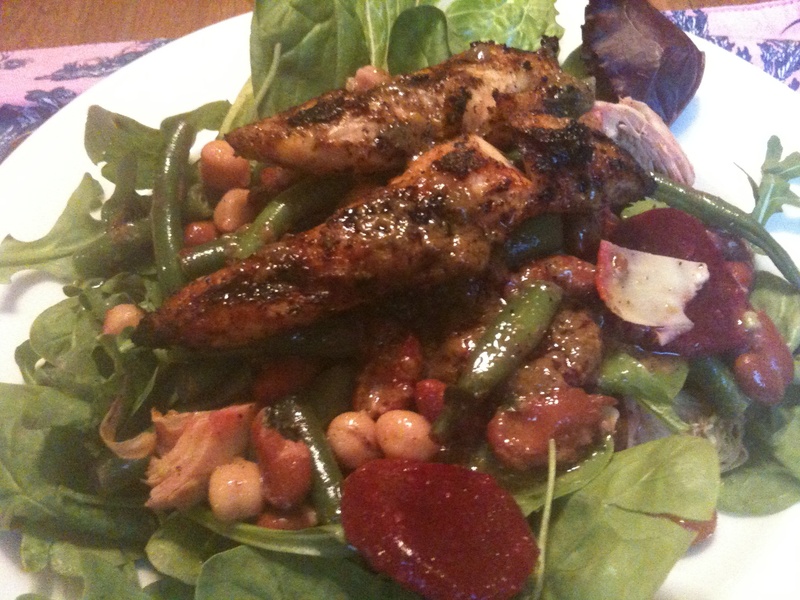 Over mixed greens, there were chickpeas, kidney beans, green beans, beets, artichokes, and grilled chicken. All the ingredients were marinated in a vinaigrette that had olive oil, vinegar, sugar, lemon juice, and mint. The combination was so hearty that it really was a meal instead of a dinky side salad. And, it actually required little chopping… you can get some of these ingredients in a can if you are in a rush! No boring tomato, cucumber, lettuce combinations here! These combinations inspire me to get creative with my veggies… and they make all the peeling, chopping, and slicing worthwhile.